Do you have a surplus of melons? Drying can turn them into a wonderful, candy-like snack or ingredient. 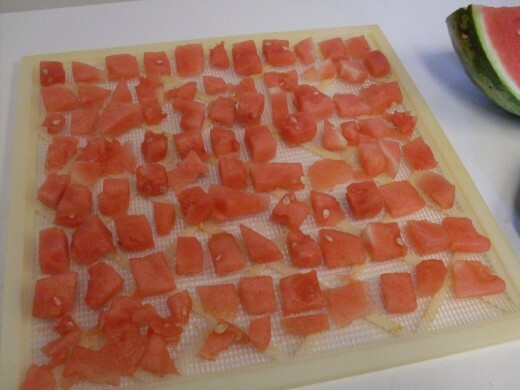 Dehydrated melons have many good uses, and with a little bit of experimentation, you will find many ways in which you want to use them. 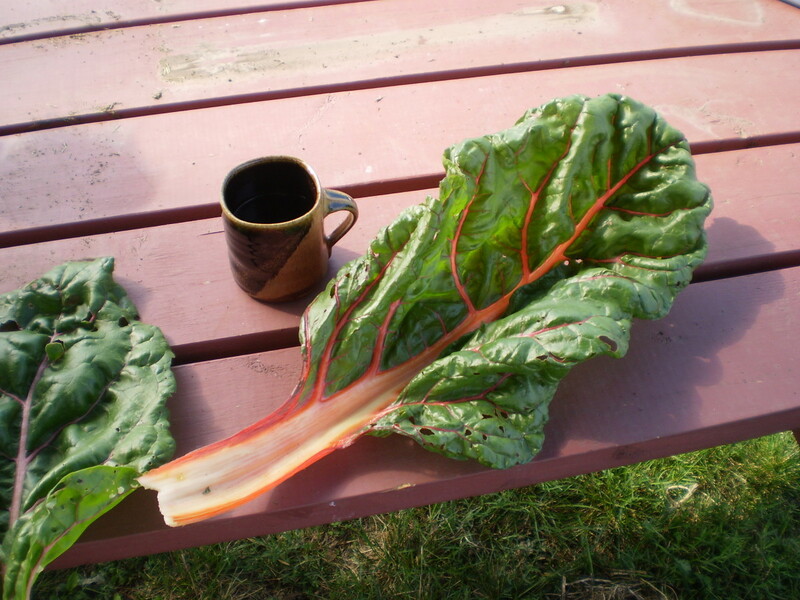 You may even grow a crop - or buy more than usual - just so you can dry them! I have demonstrated with watermelon, simply because that's the kind I had many of at the time I could take these pictures. But you can use any melons you like. 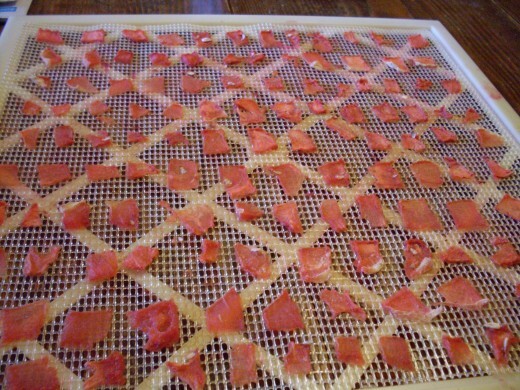 A dehydrator, either commercial or home-made. Sun-drying might work in very hot, dry weather, but won't be as reliable. In this case, use screens covered with sheets or pillowcases to keep insects off, if you don't have a well-constructed unit surrounded tightly by screening. Flies, bees, wasps, beetles, and other lovelies will be quite attracted to the sugar in the melons! Storage bags or jars. Any freezer zipper bag or tight-sealing jar (even plastic) will do. 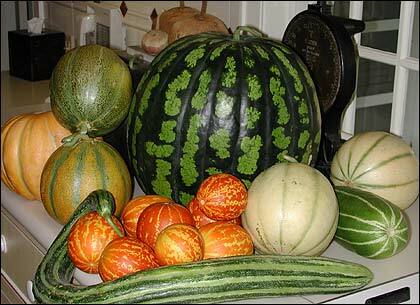 5-15 minutes per melon for preparation - depending on size - plus drying time (varies a lot! ), and cleanup. Expect the total dehydrating time for a full load (in a big, square-type dehydrator) to take anywhere from 8-20 hours, on average. Watermelons take the longest, as they have the most moisture. They will also leave the most juice on your work surface. Make sure outside of melon is clean. 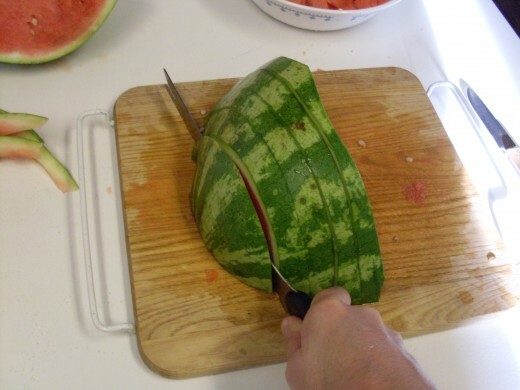 Begin by slicing melon into manageable chunks. 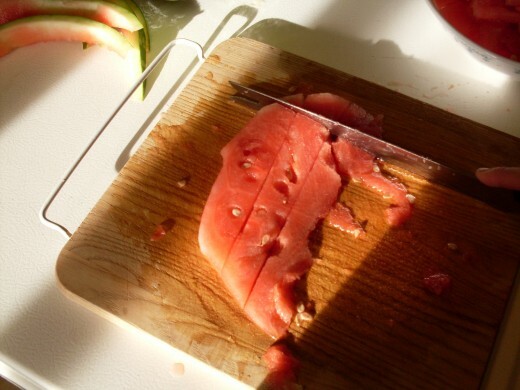 Then slice it into slices between 1/2" and 1" wide. 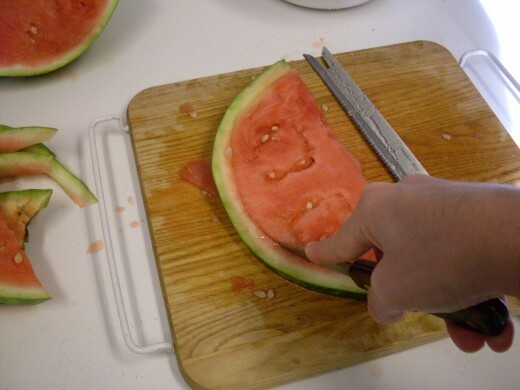 ...then cut melon flesh into 1/2" pieces. 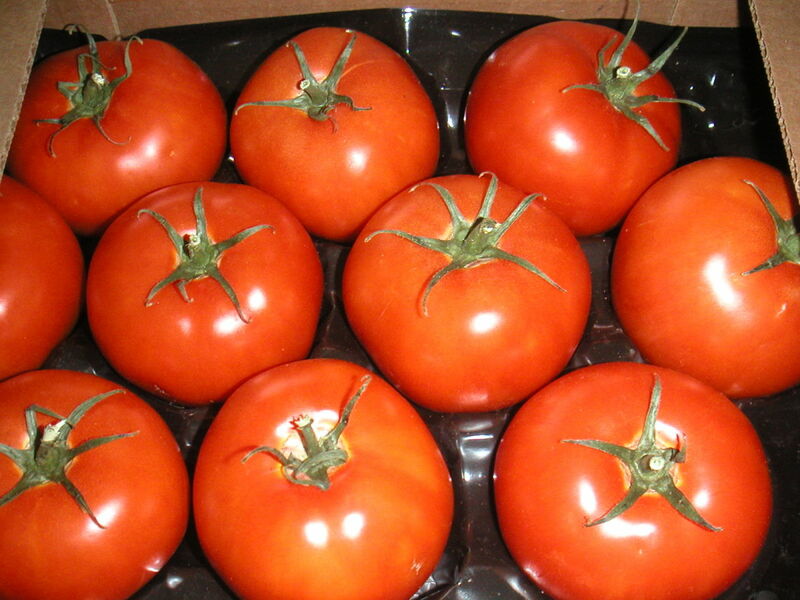 Arrange on drying trays or racks so that air can circulate freely. Dry at 160* F. for 2-3 hours, then at 130* until dry. "Dry" means leathery, without any damp spots. 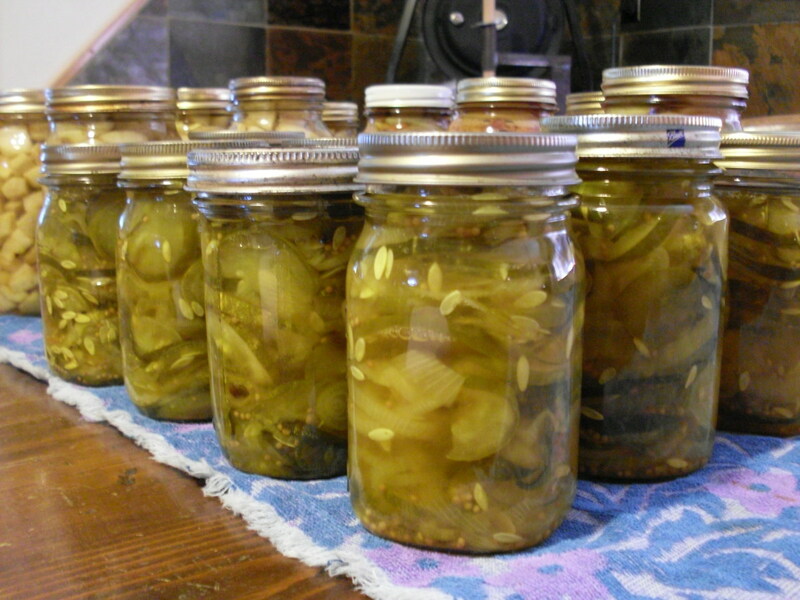 Store in airtight sacks or jars. Freezing will allow you to keep the dried melon almost indefinitely without spoilage. in oatmeal (cooked or not cooked) - try honeydew melon with blueberries and pumpkin seeds! anywhere else you want the flavor of melon! The texture of dried bits is similar to dehydrated pears - somewhat brittle, somewhat chewy, with a high sugar content. Freezing dried melon is best for long-term storage. A large quantity of melon will fit in a quart zipper bag or jar, and doesn't clump together. It is always ready for you to shake out a few pieces for whatever recipe you have at hand...or simply snack on a palmful for a pick-me-up. 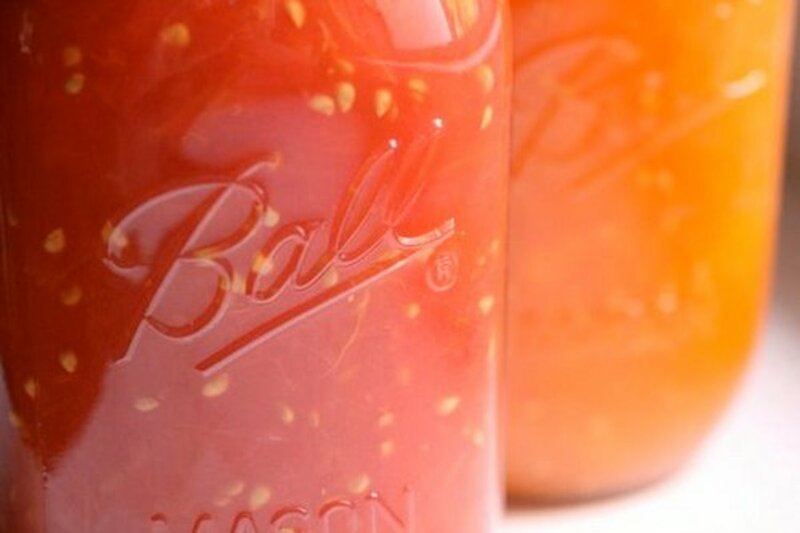 Depending on the humidity or your home (drier is better), it may be possible to store melon for a few months in a fairly tight-sealing jar on a pantry or cupboard shelf. I have never had a problem with moths or other pests getting into my melon stores...but if you do, please comment below so the rest of us can learn from your experience. The easiest way to clean the larger dehydrator trays is to put them in the bathtub in tepid water, then use a gentle brush to scrub them. You can add dish soap if necessary, then rinse them thoroughly. Usually, melon juice washes off easily after a few minutes' soaking. The smaller round trays may, of course, go right in your sink, and get the same treatment. Unless you are drying different types of melon which may flavor each other, it is usually not necessary to wash trays between batches. You can wait until the end of your melon-drying period to clean them, unless insects or other animals have gotten to them...supposing you are drying your food outside in the sun. I like this. I never heard of drying Melons. Thanks for sharing. Thanks for sharing this helpful tip. I've never thought about drying mellons. I will have to give it a try. Thanks again! HealthyHanna, I didn't think of this on my own, either. I found the idea in a book which was put out in the '70's during the original "granola" craze. ;) But the process actually works very well. Other things which are largely water - such as zucchini - can also be successfully dried. I have a lot more articles in the works showing how to do more types of food. Wow! I never though about drying mellons. They are all water! RunAbstract, you're welcome! I hope your dried melon is everything you expect it will be. I LOVE THIS!!! Now I can't wait for mellon season! Wow! Thanks for this nice and healthy idea! Ooh, that finished product looks good. And to save that taste of summer for a chill winter day . 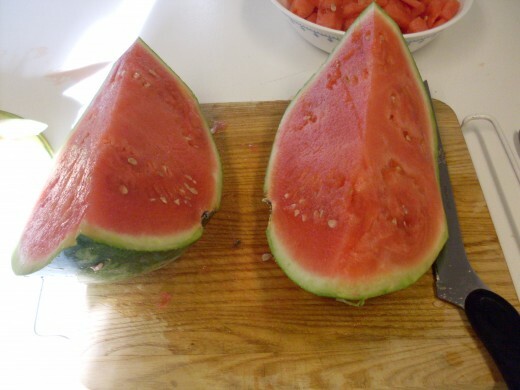 . .
Minnetonka Twin, I so hope you take the time to do melons this way! They're delicious. 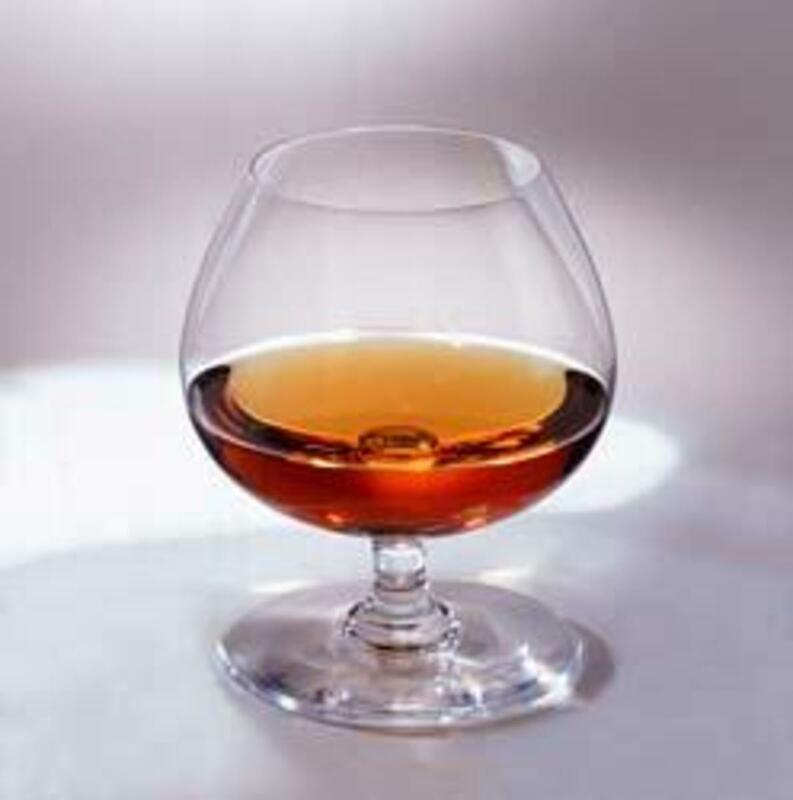 However, they don't pair well with much of anything else, as the flavor becomes too concentrated. It's not like apples or peaches that you can mix'n'match with other dried fruits.